Bill Brendling has just released a bare metal version of MEMU-PI. Just copy the contents of the Zip file to a FAT formatted SD card and you are able to boot straight into MEMU without needing to do any compilation or configuration. It's been a while . . . . .
Claus has released another platform game conversion for MTX. Hustle Chumy, originally released for the SG-1000, available from the downloads page or from Claus's site. Arto Kivimäki has generously donated an MTX500. It was quite expensive to ship it from Finland, but as I did not have an MTX with a language ROM, it was worth it. As well as the Finnish keyboard and language ROM, the machine came with a copy of the MTX Operator's guide translated into Finnish in Finland. Details of the "new MTX hardware interface" are now available . . . . It is a small internal PCB that attaches to the keyboard header on the MTX computer board and allows a PC keyboard (PS/2 or USB) to be used alongside, or instead of, your existing MTX keyboard. 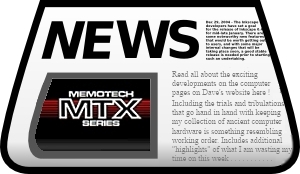 Not many web updates I'm afraid, but things have been happening on the MTX front . . . .
Memotech disk controller (FDX/SDX) USB Floppy Drive emulator available . . .
Do you have a Memotech disk controller (FDX/SDX) with unreliable drives ? It is now possible to replace the floppy disk drive(s) with a Gotek USB floppy drive emulator thanks to OpenSource firmware released by Keir Fraser. I have added one to one of my FDXs and it is working well - all for under £15 ! Phil Fagan has generously donated an MTX500 owned by his late brother, purchased when he was serving his apprenticeship, c.1983. The machine came in it's original box and polys, along with all of the original paperwork. It is in pristine condition and is the best MTX500 that I have - thanks a lot Phil ! Exciting (not really "exciting", but it is hopefully of interest) new MTX hardware interface coming soon . . . .